How can something so simple, be so good? I ask myself that every time I make this homemade beef and vegetable soup. For years I tried all sorts of additions and spices and herbs but in the end, the one time I just made it simply without the addition of spices and herbs, was the time we loved it the most. That was back in January of 2007 (according to my scribbles on the recipe I wrote out as I made it) and I've been making it this way ever since. I do play with the recipe based on what I have on hand. A mixture of crushed tomatoes, tomato juice, tomato sauce... as well as more or less of the basic vegetables I put in it. Sometimes I put meat it, but other times I don't! Using beef broth or bouillon gives it enough flavor I can leave the beef out if I don't have something on hand. I say that, because I don't like using ground beef, so I make this when I have leftover grilled steak to use up. Actually, I usually grill 1 or 2 extra just so I can make this. Oh! And you can simmer it on the stove, or put it in a crock pot. Either way. 3 1/2 cups total of tomato juice, crushed tomatoes, diced tomatoes with juice, V-8, etc. Place all in a soup pot or Dutch oven, bring to boil, reduce to simmer 2-3 hours. Or place all in crock pot and cook on low 8 hours. SOUP! I posted this about 3 months ago, but today is COLD and RAINY and CLOUDY and darnit, that makes my body want some nice, hot, comforting soup. This has been posted before, but I'm craving it this week and thought I'd repost it. In the past (for bake sales and school functions) I've made gourmet style apples, drizzled in 2 kinds of chocolate and caramel over tiny bits of dark chocolate, toffee and candies, all wrapped in plastic wrap, then pretty cellophane and tied with a ribbon; but you don't have to be fancy to be awesome. These are so easy, it's a great project to do with your kids. Yes, you may get a little bit messy from the sticky, ooey, gooey caramel, but that's part of the fun! 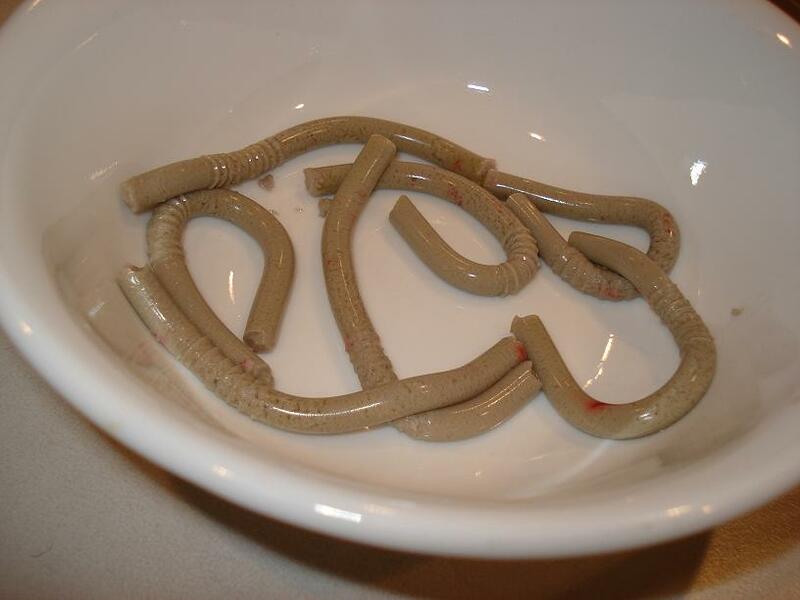 Edible Worms for Halloween Fun! This is a blast from the past, but it's a good one. Originally posted back in oh, 2006 I think! But it's getting close to Halloween so let's run it again! Yes, one year when the kids were younger, I made edible worms. And not pretty red and yellow jello worms, but worms that were a nice ugly color. They may have looked gross, but totally realistic and tastes good. Yes, they taste good - truly! They taste like a dessert of jello and whipped cream. But OMGosh to see a pile of them is just so gross. LOL. Still - perfect for a Halloween party so? Knock yourself out. They are worth it. Boil the 3 cups of water and mix it with the jello and gelatin in bowl. Let it cool to lukewarm and then add the whipping cream and green food coloring. 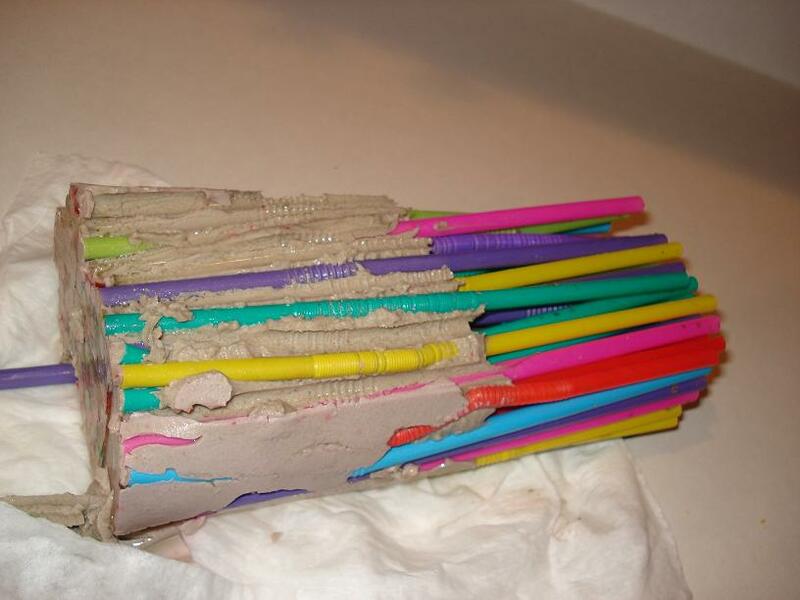 Pull the tops of the straws out so the flexible part is elongated. 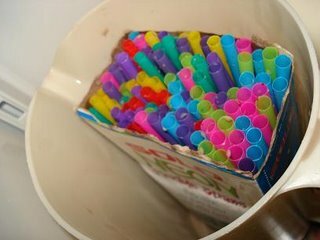 Jam all your straws back in the container. Place the cardboard into a tall container like a juice pitcher. Pour the jello/gelatin mixture to the straw-filled container and let it chill until firm. After the jello sets you can squeeze the straw with your thumb and forefinger and drag it along the straw to squeeze the worm out. I've also heard you can hold the straws over warm water and they will slip right out of the straw tube. Place them in a chilled bowl and serve to hungry party goers! I chose to put all the straws back into the cardboard container, then placed the box into a juice container. There are a couple dishes in America that we make using the name that originated in another country - even though officially the name is a bit silly when it's translated. I'm thinking of what we call "Shrimp Scampi" and everyone knows it's shrimp cooked in a garlic butter sauce - except the word 'Scampi' literally means; shrimp. So, really, the name of the dish would be "Shrimp Shrimp!" This kind of, almost falls in to that category. Carne Asada means 'grilled meat' which would encompass a variety of recipes. Still, that is what this is often referred to and there are a kazillion different versions. Basically, I bought the thin cut steaks because they were pretty affordable, and made up a recipe for the marinade by blending about 5 different recipes into one based on what I had on hand, what sounded good and what I thought I wanted the finished product to taste like. Interestingly enough, I actually had El Pollo Loco Grilled Chicken on my mind when I made up the marinade for this. I knew I wanted a beef that had a tangy citrus lime hint to it. This ended up being a big hit in our family and my husband suggested we should start regularly buying the thin cut steaks as they absorb the marinade so well, you get flavor in every bite. *Updated because, gosh darnit Ideal stopped making the brown sugar sweetener! Had to update the links! O' Henry Bars. These hold a special place in my little ol' childhood heart. We didn't eat many sweets in our home but at church events or at school functions where there was punch and cookies after, I would search the cookie table for two treats; pumpkin bars and O'Henry Bars! It was like a mini Christmas. I could never make these myself as a young little cook as we only had 1 'recipe box' of hand written index cards and 1 cookbook; a Fanny Farmer cookbook given to my Mother at a bridal shower in 1968. It had neither recipe of course. As an adult I'm thrilled for the availability of millions of recipes at our fingertips through cookbooks, magazines, websites, smart phone apps and more. But even with all these fabulous recipes at my fingertips, my family's favorite, number one, all time 'bar' is O' Henry Bars. This week I made them but I made 2 batches. One regular, the way Grandma made them and a second, half batch in which I used natural sugar substitutes. I used Ideal Brown Sugar and Just Like Sugar as it is what I had on hand. We also have natural peanut butter on hand that is only 3 grams sugar and the chocolate chips I used were Hershey's Sugar Free. They turned out wonderful! Links will be available at the bottom of the post. Mix the soft butter with the brown sugar with a spoon. When incorporated, add the oatmeal, corn syrup, vanilla and salt. Press into a lightly sprayed or greased baking pan of your choice. 9X13 is a great size. Bake at 350 degrees for 15 minutes (less for a really dark pan). Cool. Melt chocolate chips and peanut butter. Spread on bars. Chill or let set until the chocolate sets up. I like to store in the refrigerator to keep the chocolate nice and firm as we currently live in the deep (hot and humid) South! UPDATED TO ADD: A million THANK YOU's to reader 'Susan' who emailed me to say I forgot to put the "T" behind the 1 in the flaxmeal ingredient list. I am my own worst proofreader. I see what I meant to type and not what is there. I love saltine crackers and always have. As a child, grabbing a handful of crackers was the perfect snack. I also learned early on how great they are dipped in a big glass of tomato juice! Crackers are the perfect first food after being sick, and they saved me during 2 of my 3 pregnancies when nausea the first 5 months (yes, 5 months) had me on my knee's in front of the toilet. I use crackers not only in soups (obviously) but I use them in recipes for desserts, cookies, bars and pie crusts. But they although they are a bland, easily digestible food for most people, once your system decides it doesn't like flour products, it's a painful side effect of enjoying them. But... some soups (like my favorite Cream of Mushroom) just cry out for crackers! I made homemade Smoked Gouda Cheese Soup this week and happily enjoyed 'no flour' almond crackers with it. Not quite the same texture as a saltine, they were a great substitute and they actually stay crisp in soups, which of course our favorite saltine does not. I've posted my almond thin version of a "Wheat Thin" cracker many, many times since I started to make them about 12 years ago - and they are perfect for cream cheese, dips and cheese, but they aren't quite the right cracker for soup. This one, with the sour cream and the addition of a little oat fiber, makes it a little more cracker like for soups. Overall, I'd give them a thumbs up. Preheat oven to 250 degrees F. In a bowl, stir together the ingredients and form a dough. Roll out thin between two sheets of parchment paper. Sprinkle the tops with additional salt. Score the crackers with a knife or pizza cutter. Prick them with a fork about 4-5 times each. Bake approximately 1 hour on parchment, breaking apart and flipping the crackers after about 40 minutes, to ensure they are all baked evenly. Store air tight. I hate to admit it, but the Honeyville almond flour is the best quality for baking - unfortunate because they are so EXPENSIVE! And they keep raising their prices. They were $29.99 for a 5 lb. bag last year and I bought my last bag a few months ago for $35.99 (I buy 2 and freeze mine). I see they are currently listing for $39.99. Ouch! Almond flour is so much more expensive than the cheaper wheat flour. In 2006 I started to save recipes to my 'blog' with the intention of it being little more than a place for me to store my own recipes; those I already love, those I planned to make and those I filed away to make 'some day'. Well, over 7 years later this website is what it is, but looking over some of my old unpublished files I'm bummed that so many of them have become 'lost' in the files and never saw the light of day. A very old fashioned 'brown bread' recipe. 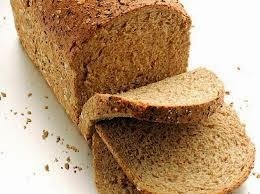 Brown bread is simply, wheat bread... which is one of the few food items that I have never been able to master. Oh, I can do partial wheat recipes, but this one was 100% whole wheat, and typically my full wheat breads turn out heavy and dense and don't raise as I wish them to. That is perhaps why I tucked this away into my 'make some day' file back in the spring of 2007! Because it's old fashioned it calls for compressed yeast, which most of the recipes today don't use anymore. You can find the amounts to substitute with our more standard dry yeasts here: Yeast Conversion Table. According to their table it will take about 3 1/2 packages dry yeast or about 7 teaspoons. I hope to make this recipe this Fall on a cold, Autumn day. And although I could make a white/wheat bread that would be wonderful and delicious... let's see if I can finally pull off a 100% brown, whole wheat bread one of these days. Mix in order given. If scalded milk is used, allow to cool before adding. After mixing dough, oil the top and refrigerate three to five hours before it is set out to rise. This gives the flour a chance to absorb the mixture in the other ingredients. The dough is a moist and sticky dough when it is first mixed. After refrigerating, set out and allow to rise to double in bulk. Knead well on an oiled board. Bake at 375° for the first fifteen minuses and then lower oven heat to 350° for another 30 minutes. Ohhh Henry! O'Henry Bars - Oatmeal and Chocolate with a Sugar Free Version!